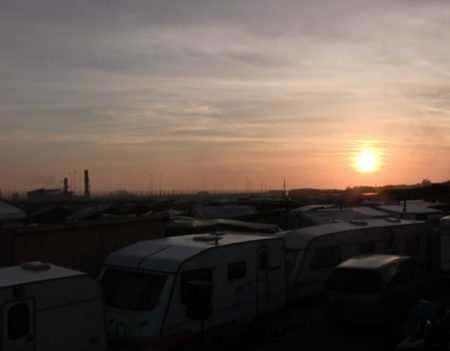 Apart from the odd father attending to the needs of their families, most Syrians sleep in late in the Jungle in Calais. They are wrapped up inside their tarpaulin and plywood hovels resembling one of those Hoovervilles from Steinbeck’s Grapes of Wrath. Sometimes new arrivals, exhausted, just curl up and sleep on the dusty path, not caring that in this makeshift camp rats are oblivious to men. In fact, this is the very reason why they call it the Jungle; for here men live like animals. The Junglists though, whether Syrian or not, don’t sleep in because they are idle. They have been up all night trying; trying with an indomitable will to reach the white cliffs of England. England though doesn’t want the Syrians or any other Junglist. Westminster has invested France with vast funds to put up fencing as white as the cliffs of Dover. 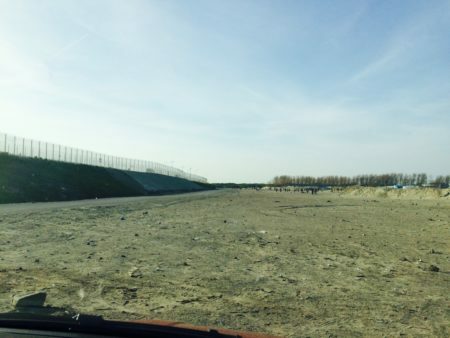 These fences tear apart Calais’ green expanse and resemble the Israeli security measures in the Occupied Territories. These are patrolled night and day by the police, gendarme and the hated CRS, the riot police. The CRS have the role of Roman centurions on a frontier outpost, desperately trying to keep the barbarians out. As the sun sets, you see them putting on their shin guards, shields and helmets at the petrol stop where the English stock up on some cheap plonk. Usually there are eight CRS vans, each carrying twelve men. 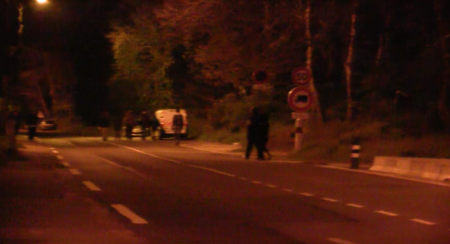 There are other vans concealed in the shrubbery, ready to throw their spotlights at opportunistic Junglists, so the riot police can move in with harsh batons and pepper spray. The powers that be have taken many measures to prevent the men from going to England. They have advised that the lorries with no cargo leave their carriages open during the night, so that the Junglist knows that there will be nothing to protect him from the pepper spray once it’s opened. 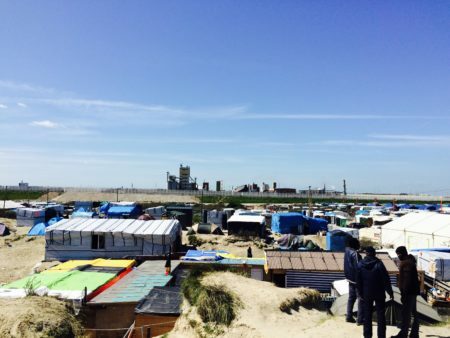 The trucks heading towards the Calais port follow a strict procedure. Once they reach junction E16, they are inspected by the police and then they are instructed to launch themselves towards the ferry port so they are not intercepted by the Junglists. This enclosed stretch of motorway runs right alongside the camp and you can see the trucks hurtle down towards the port as if taunting the men. As a further precaution, the authorities have created a buffer zone along the fenced motorway. Now the Junglist will have to make that hundred and fifty meter run towards the fencing to get at the trucks. There is always a police presence in and around the camp. But it is in the evening that the CRS makes their presence felt because, under the cover of darkness, the Junglists try to make it to England. In the evening, if the men have managed somehow to evade the police, they cut the fencing and wait for one of those trucks. When they see one truck hurtling towards them, they jump in front of the truck hoping that it will stop. Many lives are lost in this way, especially the children, because they are harder to spot and tend to work in packs. Other times the Junglists throw something in the path of the truck. Whatever the methods, the objective is the same: create a Dugar- a traffic jam of lorries. When the cry for Dugar is heard, distinct whistling noises spread across the camp and the Junglists start to move in the direction of the Dugar. They have half an hour to try to get through the gap in the fencing and clamber into the trucks that pile up before the police arrive. It used to be two days before they came but now they are here within half an hour. The police have little choice but to fire rubber bullets at close range because they are outnumbered and most men will have knives as standard issue; how else are they going to cut the fencing? Sometimes the hot tear gas canister gets thrown back by an Afghan wearing gloves and the police get to taste its acrid smell. Most men fail and laugh about it afterwards, showing their bruises; it’s gallows humour, the same humour you find in war torn Syria- a bitter dark sort formed in the hearts of cynical men. 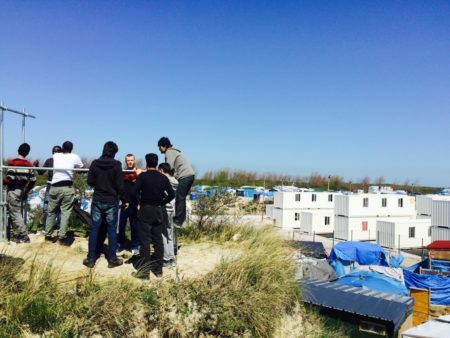 More recently the authorities have cut the camp down to size. The camp used to be one kilometre by half a kilometre, but the authorities have bulldozed two thousand Hoovervilles which promptly moved to the southern precinct. They then destroyed the southern precinct so that in eight weeks the population in the northern precinct increased fourfold. But it is not all bad news: the buffer zone now serves as a great place where Afghans can bowl googlies and be struck for six. They can shout ‘no ball’ or ‘Howzat’ as if they were playing at Lord’s cricket ground to their hearts’ content. Others, like the Eritreans and the Syrians, don’t quite understand cricket, and you hear them making comments as to why you need to keep your arm straight when bowling. They stick to the simplicity of football. When one of the Syrians try a ‘muhawala’- an attempt to cross the English Channel- it is as if the man is going off to the war front. I met Ammar cutting onions at a soup kitchen. He is a pensive quiet man, thinning prematurely at the top. He smokes rolling tobacco sitting on the roof of the soup kitchen. Men say he should be on suicide watch or on anti-depressants. It is hard to tell whether this is the case. Ammar is from Qusayr, Syria. He escaped after his city fell, his family is scattered all over the world. His mother is in Egypt, and three siblings in Lebanon, Sweden and the UK. He says he doesn’t care for any country and will return to Syria, “better to die there in dignity”. But despite this, he is still going to try to get to England. Ammar serves dinner to the Junglists who form an orderly queue at seven o’clock. And then wearing his crocs, with a bag donated by a French girl, he bids farewell and off he goes into the night. He is convinced that he will make it to England tonight. Perhaps we will never see him on this earth again. He’s jumped trains, clambered onto trucks, by hook and crook tried it all and failed. And yet tonight he is convinced he will make it. Everyone thinks they will be the one. There is another, Ali, sitting in front of a shop. He is visiting the Jungle. He made made the journey from Afghanistan through Italy, stayed there long enough in Naples for him to speak Italian. He too, ripping up a naan, says he’s been trying. He once made it to England but was sent back. But he is going to try again, “Fanculo tutto il mondo” he says apologising for his swearing, “only England will do. Germany, France, Italy is (sic) racist, they treat us like animals.” And then there is fourteen year old Hani, from Aleppo whose parents were killed by the Syrian regime, he too tries every night. He too has tried to get on the Eurostar which, if it catches you, doesn’t even stop. Apart from a slight bump, no one onboard will know that a child died on their journey into St. Pancras International. It seems impossible to pass through the fencing, the walls, the buffer zones and tunnels, but they do. There is something quietly quixotic about them as they try night after night. They embody the indignity of the ‘have nots’ against the ‘haves’, of human folly and yet at the same time hope. Has England become an obsession or does it contain some hidden street paved with gold? In the UK a refugee will receive five pound twenty a day, he will rely on food banks and suffer hardship but he is safe and that is worth its price in gold. After all, these people have journeyed from Eritrea, Afghanistan, Iraq, Syria, Libya and many other countries escaping brutal dictators and war. The English channel will not thwart them. 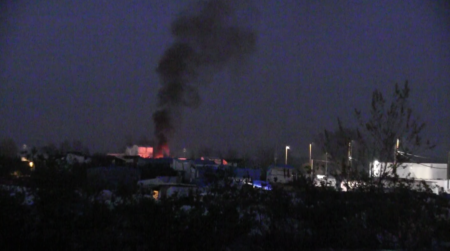 In fact, during the night, the Syrian corner of the camp is lit up by a twelve foot flame seen by all. Initial fears that the shanties are ablaze are dispelled by the sound of whooping and singing. One of their brothers have made it to London. How? God knows, but the story is a testament to human resilience. If Ammar makes it he has to convince the UK authorities that he has arrived with out knowing that he has been transiting through other European countries. More than that, he hopes that he hasn’t been snapped up by one of the men working for the British intelligence services. Junglists are aware that many people at the camp work for the intelligence services because friends who have made it, have seen them at Dover police station fraternising with the officers. In truth, the security services have no choice. The Jungle is a security concern, especially in the wake of Paris and Brussels. For Ammar, though, there are easier ways. 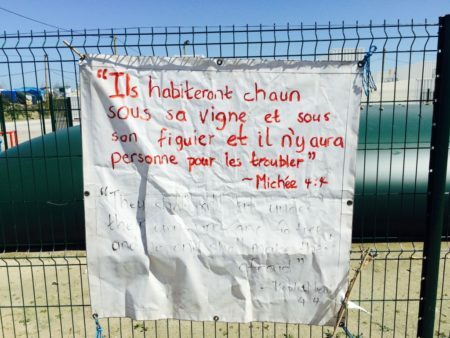 He can seek asylum in France and then be put in Camp Salaam with its the pristine white containers and warm showers. But Camp Salaam feels like prison. They are kept there till their application is processed. Those that apply seem to be from the Francophone world so France is the most logical destination to seek asylum. In any case, they probably do not have any finger prints any where else in Europe. If they do, the Dublin Agreement III requires that the host country send them back to the first European country of entry. They will be deported from that camp and find themselves in Serbia or Greece. This is what the Junglists fear the most; being sent back. These refugees prefer the freedom outside of Camp Salaam, but the freedom of the Jungle is fused with the ever pervasive smell of human excrement and rank green water that gather in pools where brown rats have pool parties. Each community rests with their own. Each area is loosely identifiable. The Kurdish area has its flag fluttering red, white and green with the sun in the middle. The Afghans with black, red and green, the Sudanese more so for their practice of playing dominoes at all times of the day and burning incense. The Syrians have no flag, neither the flag of Assad, nor the flag of the revolution flutters here. Most are barely men, sons of farmers who joined the uprising in their teens. It is hard not to love their generous spirit. They continuously fill your cup with coffee and tea. Many of them, as Umm Sulaiman says, hail from “Der’aa al-manquba”- “The city of Dera’a that is riddled with holes”. It is the same city where the Syrian uprising began. And yet, after five years, the revolution, at least from the Jungle, is hard to discern. In April 2013, the former Syrian Brotherhood Spokesman Zuheir Salem warned: “If Assad stays, you will see Europe flooded with fifteen million Syrian refugees.” This is coming to pass. But Syrians do not unquestioningly apportion all the blame on the regime or its barrel bombs for the failure of the revolution. The rebels have had five years to cobble together a credible opposition and they have failed miserably. Syrians can’t quite figure out why the revolution has failed. Some of the refugees say, without providing a shred of proof, that DAESH or ISIS is the creation of Shi’ite Iran with its head quarters in London. Others blame America and others blame themselves. Abu Umar from Idlib, pulls on his cigarette, sitting in his tidy hut and says: “Is there any government in the world that isn’t oppressive now? Is it not the case that my cousin took the bribe, my brother tortured prisoners, my neighbour did such and such? We are given rulers that we deserve as the Quran says.” Abu Umar believes that Syria’s solution can only be solved once Syrians achieve inner piety. But though they have no common flag, there are still strong kinship ties. Umm Sulayman, for instance, has no one. She looks like one of those Okies from 1930s America. Her children, one six year old boy and one two year old girl, play barefoot in the sand. Her husband was killed by the Assad regime and now she relies on her countrymen and the Jungle to support her. There are men like Jamal, an engineer from Newcastle, who ensures that her camper has enough gas, that they are fed and that her two children are looked after. Like the Okies who dreamt of going to California, she hopes to join her family in England. But in truth; there is no possibility of that. The lawyers can’t help her, the Dublin Agreement III again is the problem. If she arrives in the UK her application for asylum will fail. She has to convince the immigration officers that she did not stop in any other country. If her story is not airtight the immigration officers in Lunar house, Croydon, will put holes in it. In the camp, religion does play a part in ordering the lives of the Junglists. One greeting of salaam, one prayer to protect their family breaks down barriers and suspicion. There is one church and seven mosques. Masjid al-Mouhajer is the one the Syrians go to. The central mosque is the Umar mosque, a tarpaulin structure, set up in order to unify and give a sense of solidarity amongst the Junglists. Umar mosque was the brain child of a Syrian, Abu Omar, Jamal and other imams who came together and encouraged the men to set up a mosque for the sake of fraternity. It is this mosque that helps to diffuse the tensions that flare up in the camp periodically. The mosque is led by Imam Katibullah, a Pashtu with piercing grey eyes who speaks Arabic, walks the camp in his black shawl, panjabi and Pakhool, and gives pastoral care to all and sundry and seems loved by the camp. At evening prayer, it is as if all the ills suffered by the Muslim world gather; there stands its past glories and its present misery and its future hopes, all united behind the Afghan Imam, Katibullah. Watch the men pray and raise their hands to their Maker and you see that some pray for paradise and some, dare one say it, pray to England, and some pray as if tonight will be their last day on Earth. And sometimes it really is their last day. Whilst the politicians in Westminster wrangle over what is to be done, the people of England show the same generous spirit that accepted refugees in the past, whether Hugenot Protestant, Jew, Pole or East African. This is acknowledged by the Junglists. One guesstimate puts it that ninety percent of the volunteers are from Britain. They donate disused caravans that go to the most vulnerable. There are makeshift medical clinics offering primary care, youth clubs, legal advice and other services, all funded by these volunteers. Names like Sophie, Claire, Iona are mentioned with intense reverence and affection and, though some of these volunteers do not believe in saints or God for that matter, they are trusted like saints and many children are given to their care. But there is also a sense that whilst these men and women give to the refugees, they too seem to gain something. It is hard to tell as to exactly what that is, but as Jamal says: “they cannot go back to their societies and live normally after the Jungle.” Whilst some volunteers come to experience the anarchic freedom, the hospitality of the men with nothing, perhaps even to savour the cannabis, you get the sense that they too maybe searching for something. There are also those like Jamal who are clear as to why they do it. Him and his wife and a handful of Malaysian volunteers feed a thousand men a day and run it purely on the good will of those across the English Channel who donate food and goods. He sold everything to set up a soup kitchen and is also the camp’s handyman. Why give up everything, I ask? He replies: “My father used to read a Hadith of the Prophet at bed time, which stayed with me: ‘no one of you really believes if you go to bed with a full stomach and your brother’s stomach is empty’”. And so Jamal, his wife and a bunch of volunteers serve food to the camp every evening. But it is not enough; most newborns in the camp are still undernourished. That is not to say that there is not ugliness. The camp is etched with the pain and desperation of its inhabitants. One Junglist, an Iraqi from Salahdin, who looks like a cross between a guitarist from Nirvana and an army major, complete with blond beard and bob tail, chops onions and serves the poor and yet he goes to bed seeing visions of both his brothers having their throats slit in front of his very eyes. Abu Uday, a Damascene, has the picture of his six and three year old in Lebanon hanging on his wall, as a permanent reminder of his duty towards them. Two days ago six boys were found in a Hooverville in great distress. They had been raped. Children disappear in the camp. Jamal tells of a story where a mother abandoned her six month old infant and it was looked after by the camp; moved from family to family. A phone call came, and the voice claimed to be the newborn’s family, Jamal rushed to the hospital where he was told to go with the child. But on the way, they stopped at a cafe and he was asked to hand the baby over to some men; he realised they were people smugglers and pulled out. There was a notorious Kurdish smuggler known as Hajji, he was hated in the camp. Before making it to England Hajji had already spent considerable time in an Italian prison smuggling people to Italy from Libya and had set up shop in the Jungle. It is the presence of these undesirables that means that the camp has ears and is rife with intelligence services who do not know who these men are and what their motives are. War has no doubt changed the character of these people. Jamal recalls a scene described as if it was from the battle of Agincourt, where the Afghans squared up to Sudanese and battled each other with flaming projectiles, sticks and knifes. Sixty men were injured, ten were hurt critically. The fighting occurred right in between the mosque and the kitchen, the latter being used for first aid. None of the Afghans knew why they were fighting; it was merely in solidarity with their compatriots and the Sudanese likewise. It turned out that it was a dispute over a bicycle: an Afghan had not paid the ten euros owed. And so the Sudanese came to collect and a medieval battle started. The Afghans went to aid their man and the Sudanese theirs. Hajji fired two shots in the air, only the playing of Quranic verses on the loud speaker from Masjid Umar calmed the situation down, and the next day, battered and bruised, the same men were hugging each other and asking each other for forgiveness. As Jamal explains, when you have witnessed twenty years of war it corrupts you. It becomes instinctive to fight, that’s why the French police are puzzled as to why the Afghans just react by fighting and throwing stones when there is no need to. They have seen nothing but war. The jungle has the good, the bad and the ugly. And no doubt politicians will continue to build bigger walls that cost millions to keep them out. 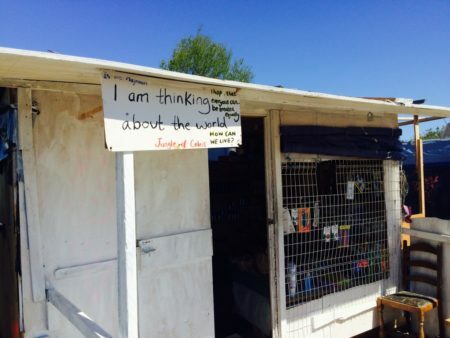 There is a sign in the Jungle asking the question: “Is me majnoun [mad] I am thinking about the world. I hope that we can be treated equally.” But the Jungle is not unique, there are more Jungles being built all over the world. The same phenomenon can be seen in Buenos Aries, Santa Fe and Rio De Janeiro. In Lima, poor Chileans scale the 10 km wall to glance at the Haves, they are all Junglists. All over the world walls are being built to keep out the needy, the destitute and the poor. At some point those walls will fall, and if England is not careful, perhaps Micah’s Prophecy may come true in London, just as it did for Jerusalem. As for the Syrians they will keep on coming, English Channel or no English Channel, if this conflict is not resolved. Tam Hussein is an a ward winning investigative journalist and writer published by BBC, C4, ITV, Guardian, Huffington Post, New Statesman etc. Thank you for that touching article, but perhaps the West doesn’t want to implide like almost every country in the Middle East. Just a guess. I think the answer is to fix the Middle East so Middle Easterners need not flee to the West. This is the main legacy of the “Glorious Revolution” (registered trademark). Syrians are seen as the very scum of the earth, mere vermin. I am developing a deep hate for religion. It is, in reality, an ancient patriarchal control system, and has no basis in reality. That the entire world is in flames, largely because of this madness is instructive. Hate your neighbor is the name of the game. Pitiful humans. Hi ho. Which was Kurt Vonnegut’s reaction to the destruction of Dresden. Hate is a strong word. I was brought up not to hate anything unless whatever it is is out to hurt you. Most adherents of religion are peaceful. Mr. Majedkhaldoun is a good example. Militant Islam is a problem, so is secular Baathism. Yesterday I was reading a magazine article about Iran that was edited in 2008. Iran was refered to as the ISLAMIC STATE. They are the real and only islamic state. There is one Christian State (The Vatican) that is not challenging any bordering nation although it a medieval concept. There is one Islamic State (IRAN) that is now invading Iraq, Syria, Lebanon and creating unrest in all of Afganistan, Yemen, Pakistan and more. The so-called terrorist islamic state is not but a creation and a mirror of Iran. Something that legitimate Iran to bomb and invade its neighbours. جـميعهم من معين السوء قد شربوا. Something is about to take place in Raqqa but it is not clear what the deal is, more likely than not Russia and the USA have agreed to exclude the Syrian army to satisfy Turkish, US and Saudi demands. Whether that will put Kurds in charge is uncertain but Raqqa has not been a Kurdish area and I doubt it will be given to the Kurds. If Raqqa falls a new reality will face the big players and isis. At the same time that Turkey is violating the Kurdish territory and killing them and throwing them in jail, the other part of the Kurds are renting themselves to serve the American and Israeli objectives on Syrian soil in areas, that do not live in. Kurdish people have been considered beggards in Syria for the last 100 years. Assad kick them in the mouth while he was pushing them against the turkish. Syrians used to despise kurdish people with no embarrassment in private and even in public. I think it was a great mistake (I lived in a kurdish area for 10 years and I know them well) but now it would be a new OCCIDENTAL-RUSSIAN-IRANIAN STUPID MISTAKE to give Raqqa, Bab, Manbij, Maskahna and other typically arab areas to the kurdish militias. Assad is no better than ISIS. Just my opinion…. Assad is ISIS, the ISLAMIC STATE OF IRAN is not just the reason behind the Islamic State or Iraq and Syria but their architects and founders. Assad is exactly as ISIS. IRAN, ASSAD, ISIS, CIA, PUTIN, all are the same shixxt looking for the new borders of the Middle East that need a complete genocide of all arabs-non chia. When you cannot control the people you need to ethnic cleanse or send them all out of the country. In a normal democracy, Assad would have been impeached for failing to protect his country. Despots seem to hang on no matter who dies, 50 or 500,000. Assad isn’t ISIS, he is just one of hundreds of gangs who roam the Middle East causing bodily injury in its path. We commend Syria Comment for doing their diligent research of each group, no matter how small and no matter how dangerous. All the people I know living or that has lived under ISIS says the same: ISIS is ASSAD. ISIS is ruled, financed and armed by many parts but all with one purpose: destroying the revolution and creating chaos to the beneffit of occupiers. RUSIA, US and IRAN are supporting ASSAD and ISIS. This is the true. If you accept it all happening from Paris to Yemen make sense. If you do not accept them please talking about terrorists, psychopats and strange reasons you cannot explain. Even more, I dare to say that Assad, Iran and Hezbollah knew from the beginning that US/Israel were going to accept their rule over all of Iraq and Syria even if they commited a genocide as it is happening. The conditions are letting Iran reach the Mediterranean, stopping the nuclear program and accept Israel. Some damascenes pro-regimen told me in the first days of the revolution that there was a plan for a new Middle East where Russia and Iran were going to be important agents and where Assad would be a key Stone. Are Kurds carving up syria by participation with the sdf which are headed towards raqqa now? is the America’s preferred line of action and the race to raqqa is still in play? The United States program will be defeated in Syria! Sometimes I have the feeling this SC forum is full of people who have never ever been in Syria. Alan and many other from Russia, Israel or even Iran who knows. People who do not know what is going on in Syria be informed that Russia, Iran and US are playing the same game against the people of Syria. Assad is just the stupid criminal they use to execute the genocide. This is the world system of power and Assad against the people of Syria and allies in the middle east. There is no doubt that the regime which ruled Syria since 1963 is at the center of why there is a war in Syria today. Most of that period is linked to the Assads. We were told that people revolted in the name of freedom and democracy, so it is fair to hold the new thawrajiyyer (revolutionists) accountable for failing to honor their own slogans especially after the huge loss of lives and the vast destruction caused by the war which was only possible after rebels and jihadists took up arms and occupied towns. The Baath style security systems in both Syria and Iraq were created ¨so that nobody could destroy them and take its place¨ without destroying the whole country. In Iraq US (and now we know Iran behind them) decided to completely destroy the system and turn the country to ashes. In Syria US, RUSIA (and of course IRAN) have decided to let the revolution grow so that the genocide may be executed in 5 to 10 years and then the country kept in same hands without the population (that will have been massacred and expulsed from the country). Assad, Iran, Russia and US knew and shared with Israel the new Middle East that foresees a shia Iraq, Syria and Lebanon with peacefull realtions with Israel when Iran assures the Mediterranean shores, where CHIA/SUNNA conflict will be the main market for weapons and where oil and gas from Iran will provide the West. Fact is that many sane Sunnis are with the minorities-coalition that we call the Syrian regime. No minorities joined the Islamists. Assad hits Tartous and Jableh with self-terrorist attacks provoking 100 dead. After unrest has been spreading among alawite families who dont want to send more children to die, Assad needs to unify the coastal alawite populations around the regime. Terrorist attacks under the name of his ISIS is the perfect classical way. In the same way ISIS (Hezbollah) hit last winter the main shia stronghold in Beirut when protests and unrest were spreading against Hezbollah. If ISIS was really against Iran, Assad or Russia they would hit Tehran, Damascus centre, or Russian forces in Lattakia. Thumbs down just show how average people dont have any idea about whats going around them. The reaction by thawrajiyyeh to the terrorist attacks in Jableh and Tartous is a form of black comedy, many are accusing the regime of doing the ugly deed, others have openly expressed their delight on social media, very few displayed any form of resentment or discomfort. This is your revolution guys, enjoy the wreckage and do not forget to ask your sheikh if killing civilians in areas under regime rule is Halal or not !! That’s some choice! Assad or ISIS!? Almost as bad as Lieberman (Likud) and Herzog (Zionist Union) lol! MSM here in the US (with the help of ex-Israeli pols) is now calling ur government fascist! How long, these satanic rogue states, will continue to enjoy the safety? Needs to break their backbone. Do you mean terrorist states like Assadistan, Hezballistan, Putistan or Khomeinistan ? The only ‘Plan B’ a world interested in ending the cancer of extremism and terrorism should be discussing is one that involves action to curb the power and influence of the Saudis in spreading and fomenting this poison. In fact, never mind ‘Plan B’, it should also constitute ‘Plan A’. an earnest question for the distinguished journalist Mr. Hussein. Have you ever asked any of these migrants/refugees who have escaped very distant muslim-majoritiy countries, why they did not try to get into Kosovo, or Albania, or Bosnia? in other words, why did these muslim migrants all desire to enter Christian countries of Europe? didn’t NATO bomb yugoslavia to create a muslim state in the heart of Serbia, aka “kosovo”? So why don’t these escaping muslims want to live in muslim societies? Why don’t they want to go to Turkey or Saudi – where Christianity is illegal or long-ago stamped out by jihad? Is it a tacit admission, a “vote with their feet” so to speak, that Islamic socities must be fleed from? Is it the claim of these muslim migrants that they are entitled to citizenship in a Christian society?